I've had a life-long love affair with cheesecake but, until very recently, I didn't know there was a National Cheesecake Day. Even better is that it falls just 3 short days after my birthday. It's like they know me! I knew I'd be celebrating today with a huge group of my fellow bloggers but I went ahead and made the cake over the weekend so that it could be my birthday treat. In deciding what kind of cheesecake to make I borrowed ideas from a few different ones to create my ideal version. I love crust so my perfect cheesecake got a crumbly buttery crust. I love fruit topped cheesecakes and am currently obsessing over blueberries so I made a sweet and tart blueberry compote for the top. For the cake itself, I wanted to combine the best of both cream cheese and ricotta cakes and mixed it in the food processor for the perfect texture. The result was my ideal version of a cheesecake and the best birthday cake I could ever have. Don't forget to check out all the links below to see everybody else's idea of the perfect cheesecake. Enjoy! To make the crust, add the flour, sugar, salt and baking powder to a food processor. Add the butter and pulse a few times, just until the mixture resembles course crumbs. Add the egg and continue mixing until it forms a dough ball. Wrap the dough in plastic and refrigerate for at least 30 minutes. Make the topping by adding the blueberries, sugar, lemon juice, lemon zest and salt to a pot and cook on medium heat for about 10 minutes. Refrigerate for at least an hour or even overnight. To make the filling, combine the cream cheese, ricotta cheese, sugar, salt, eggs, vanilla, lemon zest and lemon juice in the food processor and pulse until smooth. Add the butter and than the flour and mix in thoroughly. To assemble the cake, place the dough into a 9" spring-form pan and, using your hands, spread it out and up the sides of the pan. This dough falls apart when rolled so this is the only way I've found. A bit tedious but worth it. Pour the cheesecake batter into the crust (it will be runny) and bake in a pre-heated 325 degree oven for 75 - 80 minutes until the top is set. If it has a very tiny wiggle when it's done, that's fine and it will set. Allow the cake to cool thoroughly before removing from the pan. Top with the blueberry compote before serving. Makes approximately 10 servings. 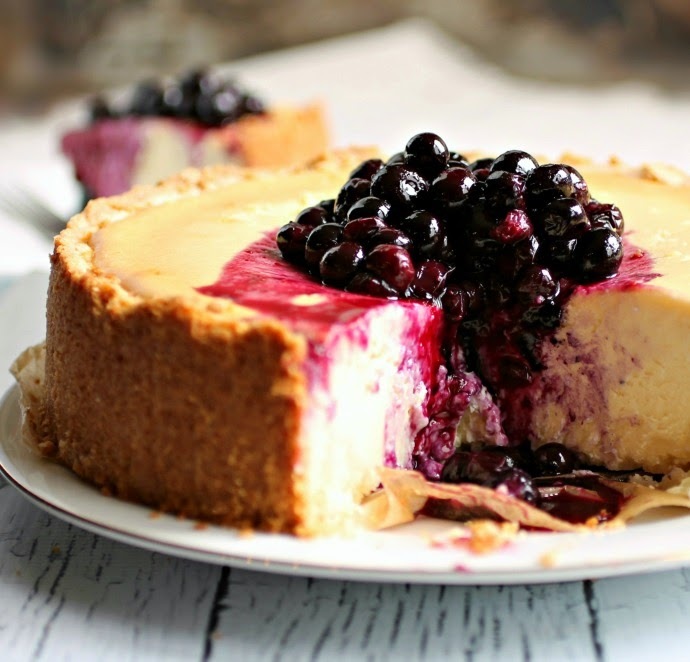 For years, my birthday cake has been a cheesecake and your blueberry topped cheesecake looks amazing! Wish I had a slice to celebrate your big day! Thanks for joining us Anita! My favorite part has to be the blueberries on top!! LOOKS AMAZING! I've never been good at getting the crust up the sides of my cheesecake. You totally nailed it! YUM. Gorgeous! I love the ricotta and blueberries combo! Pinned! 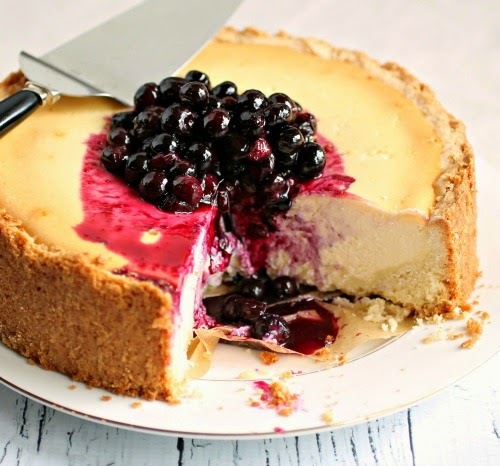 Blueberries are so fabulous, your cheesecake looks amazing!! Whoa, this is simply mouthwatering. I'm wishing I had a slice for lunch! 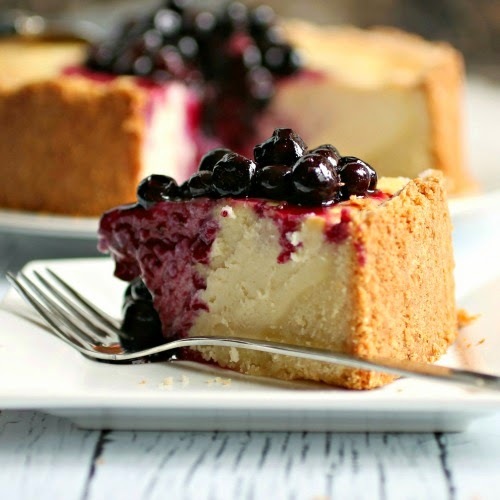 This cheesecake is beautiful, Anita, and it has everything that I love: a thick, buttery crust, luscious creamy cheesecake that I'm sure is lightened a bit by the ricotta, and a blueberry compote. Yum! Definitely a fitting treat for your birthday. I also just learned about National Cheesecake Day and am so thrilled that I did! I love that you used ricotta, and that blueberry topping looks amazing - so perfect for summer! Pinning this! Happy Cheesecake Day, and Happy belated Birthday! Anita. . total beauty!!! LOVE this cheesecake!!! I've got to add ricotta to mine next time! love! Blueberries are perfection! I obsess over them every summer. This cheesecake is a beauty!! What a gorgeous cheesecake!! Blueberries are so deliciously sweet right now and make such a wonderful addition to your dessert. Yum! I could just eat the blueberry compote with a spoon. Love that burst of color and flavor heaped on top of your gorgeous cheesecake, Anita. Those blueberries!! I'm in love! pinning for later! I love a good ricotta cheesecake! We make one every year for Christmas. It looks so yummy and I really want a piece now.